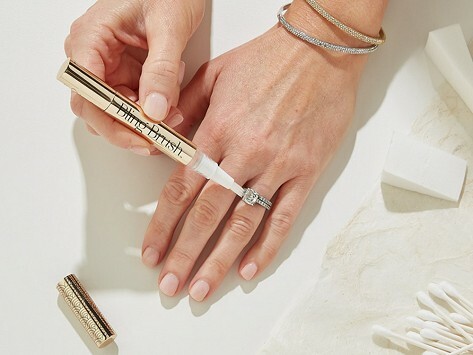 The Bling Brush is a portable, purse-friendly cleaning pen that brings the sparkle back to jewelry anywhere, anytime. Made in Texas, the brush is filled with a natural soap-based solution that’s safe to use on your fine jewelry as well as on costume pieces. Twist the brush to release the formula, then clean (even the hard-to-reach areas), polish, and look at it shine—no water needed and no spots left behind. Dimensions: 5" x 0.5" x 0.5"
Works great. Made jewelry shiny. Shipped fast too. Baublerella natural jewelry cleaning tools are the new step in your getting-ready routine that helps jewelry look as good as you do. It started with the idea of creating a jewelry cleaner women can use anytime, anywhere. Maker Chevis Douville was heading out for a big night when she realized that in her rush, she didn’t get to clean her wedding ring. Chevis couldn’t find the just-right solutions, so this go-getting Texan made her own. The shine-and-sparkle boosting Bling Brush and polishing Glitzy Glove do the job in an easier and more convenient way. And both are made with soap-based natural ingredients that won’t harm the good stuff or the fake-but-fabulous pieces. The cleaners are made in Texas and, because Chevis likes a little glamour, she made sure they look good, too. Her sparkly-bright idea is one lots of women—and their jewelry—will appreciate.